It’s a big, bold and yes, unabashedly beautiful metro-sexual modern rock lighter waiver that’s aimed at giving fans of Coldplay exactly what they’ve always craved. No not a soundtrack to committing suicide. Instead, an unambiguously romantic set of Valentine’s Day love letters destined to be played at marriage proposals, wedding receptions, baby showers, birthdays….okay, you get the idea. Wait up. You mean South Africa’s Coldplay wannabes have stopped recycling one hit wonders like “Here Comes The Man” or Koos classics like “Lisa se Klavier” and actually found their own flow? Yep. Make no mistake, sensitive piano ‘n string chamber pop come-ons (“Baby Be Mine”) and breezy Brit-rock hummables about breaking up, making up (“Giant Mistake”) and feeling all gooey about seizing the day (“Play On”) still wear the Brit-pop chart polish of Keane, Snow Patrol and The Verve. Thanks to Theo Crous’ ballsy production though, these are invariably now road maps rather than cul-de-sacs. “I’m Only Human”, “Dance” and “Window Shopper” are all surprisingly edgy indie-disco jammers that you could easily imagine Bravery and Interpol converts shaking their skinny jean-clad asses to. “Another love song, a silly love, but it’s our song and it’s forever” serenades Parlotones lead singer Kahn Morbee on achingly sensitive, string-washed ballad “I’ll Be There”. shaking skinny jeans not this interpol fan. 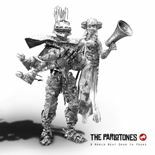 The Parlotones - A World Next Door ToYours On the contrary Theos hand in the bands latest recording is actually polished and quite tame compared to the much edgier raw garage sound of the bands previous offering Radiocontrolledrobot. Theo tamed the beast within and didnt add balls to it all at. Brit pop!!!!!!!!!!!!!!!!!!!!!!!!!!!!!!!!!!!!!! !1 The parlotones rock my friend,how could you even think twice about that one! Their music is unique,and hey even if they did sing hits like "here comes the man" the world loves it and i do 2! !They pimp the songs up and make them shweat! so to answer your question... definatly ROCK-POP!!!!!!!!!!!!!!!!!!!!!!!!!!!!!!!!!!!!!!!!!!!!!!!!!! Best yet I absolutely love the new album. The Parlotones are a class act on stage. They have brilliantly imaginative music videos. Best listened to live or alone and loud. 100% ROCK-POP.